For the last six months, I’ve been spending at least an hour a week, but generally two hours a week, with my physical therapy team working on fixing up my knee. I think a good measure of how much therapy I did is the fact that I completely rubbed off all the hair on my ankles from walking around with rubber resistance bands. Not only is my knee feeling great these days, but I’m also considering starting my own Infomercial hair removal system. Just put on these bands where you want the hair removed and walk around for six months. It’ll come right off! Anyway, a few weeks ago I graduated from therapy so I thought I would bring in some White Chocolate Macadamia Cookies to the therapy team that had to put up with me for six months. These delicious soft cookies are packed with loads of chopped macadamia nuts and sweet white chocolate chips. 1) Preheat oven to 325 degrees. 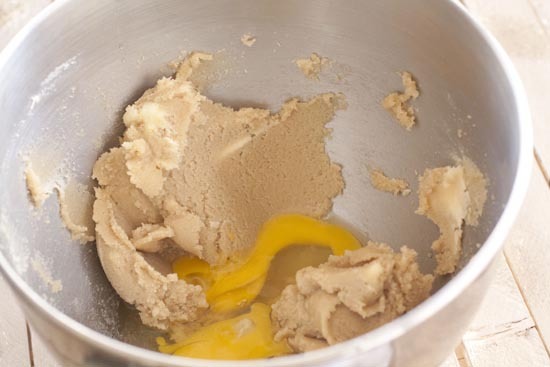 Cream together the butter and sugars in a mixer until smooth. 2) In a separate bowl mix together flour, baking soda, and salt and set aside. 3) Add eggs, one at a time to creamed butter and mix together. Then mix in almond extract and milk. 4) Add dry ingredients and mix until everything is together. Try not to overmix the dough. Then fold in chopped nuts and chocolate. 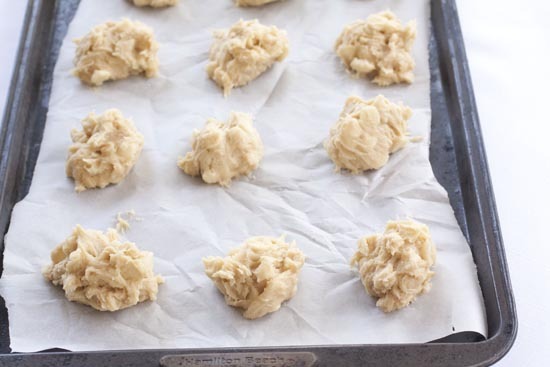 5) Line a few baking sheets with parchment paper and scoop out dough in heaping tablespoons. 6) Bake cookies at 325 minutes for about 14-15 minutes. Let cool for a few minutes before eating as they will be very soft when they come out of the oven. 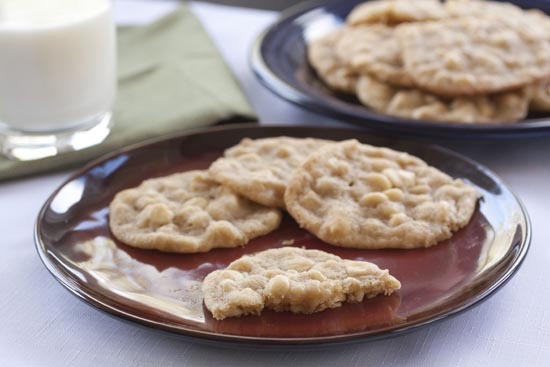 This is a pretty standard cookie dough recipe except it uses mostly brown sugar instead of white sugar. That gives the cookies a great flavor. 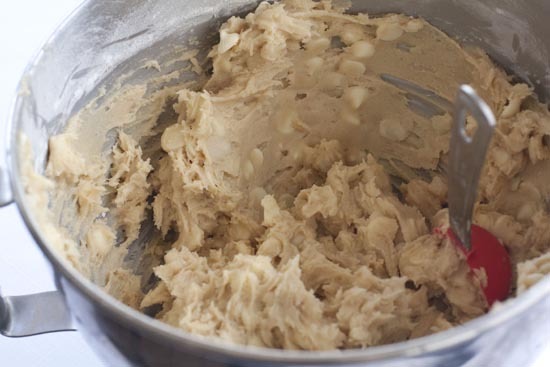 To start the dough, cream together the butter and sugars in a mixing bowl using either a hand mixer or stand mixer (paddle attachment) until the mixture is light and fluffy. Once everything is mixed together, mix in the eggs one at a time followed by the extract and milk. If you don’t have almond extract you can use vanilla, but I think almond goes well with the macadamia nuts. 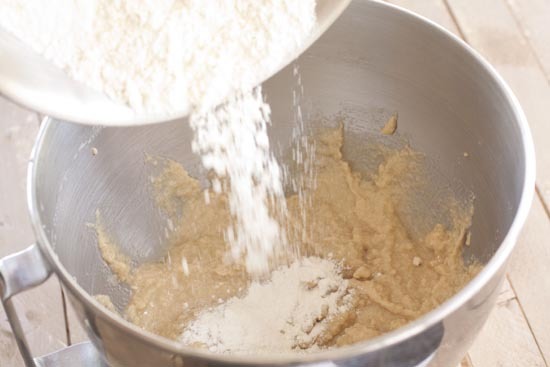 Once your liquids are mixed into the dough, go ahead and add in your dry ingredients which you should mix together separately (flour, baking soda, salt). Stir this together until you can’t see the flour. Try not to overmix the dough though. Then you’ll need these delicious add-ins. Macadamia nuts can be a bit pricy but they give the cookies a very unique flavor. You could substitute them of course, but you should try it out if you can find them. 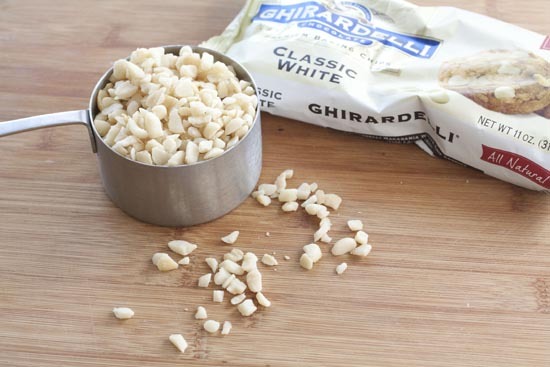 Just fold the chips and nuts into your cookie dough and try to resist eating all the dough. Try not to eat it all like this. 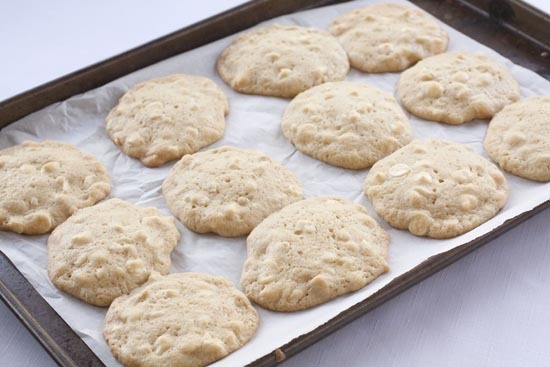 Line a few baking sheets with parchment paper and then scoop out large heaping tablespoon-sized cookies. Be sure to leave at least an inch in between cookies. Bake these guys at 325 degrees for 14-15 minutes. Then should get very lightly browned on the edges, but you want to make sure you take them out while the cookies are still nice and soft. When you take them out, they should be too soft to pick up. They will continue to firm up a bit as they cool. Once the cookies cool a bit, you can dig in. I like a few with a big glass of milk. I seriously couldn’t resist trying one of these while I was photographing them. 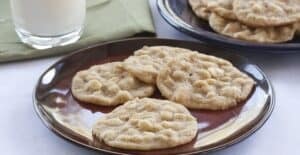 These White Chocolate Macadamia Cookies are nice and soft and are packed with chocolate and nuts. I’m not sure that they completely made up for having to listen to me complain for six months, but hopefully it helped a bit! Yum…my favorite cookies of all time! I’ve never tried almond extract in WCM but will soon. THANKS! Made these tonight! They are great! The almond extract adds A LOT of flavor! Update – these were even better the next day!! Everyone LOVED them! Best cookies ever! I made these today for my boyfriend and he LOVED them. I added the printed version of this recipe to my tried and true recipe binder.